Genève : H. Georg, 1883. Journal : Revue médicale de la Suisse romande. Description : 130 p.,  leaves ; ill., 3 plates ; 21 cm. Photographs : 3 composite collotypes. Subject : Surgery of the thyroid. Myxoedema. Goitre. Reverdin produced myxoedema by removal of the thyroid as a whole or in part. This confirmed the earlier work of Schiff, of which Reverdin had probably not heard. Offprint of Revue médicale de la Suisse romande, (1883) : No. 4, April (169-98), No. 5, May (233-78), No. 6, June (309-64). Rare, one copy located at University of Colorado Health Science Center. See also Treatment of Cretinism, by John Thomson. We cannot, nor do not want to await the publication of the report of Kocher to finish this study; if our findings agree, they only will be strengthened by the fact that our research was done in an independent way ; if they are in dissension, their discussion could always be done later ; even in the case where the work of Kocher appears ahead of this writing, we will wait to make the comparison until his facts and ours have been subject to a sufficiently enlightened criticism. This said, here are the facts that we announced and observations which supplement the data above. 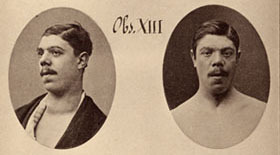 Written by the Reverdin brothers Jacques-Louis and Auguste, Note sur vingt-deux opérations de goitre provides the documentation to support their clinical observations of cachexia strumipriva (myxoedema) occurring as a delayed complication in cases involving the surgical removal of the thyroid gland. Jacques-Louis Reverdin first presented these observations to the Medical Society of Geneva on September 13, 1882 and in a brief follow-up announcement published in the Revue médicale1 that year. 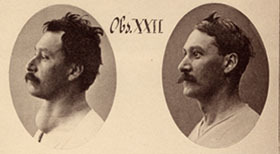 Reverdin also claimed to have shared his clinical observations with the noted surgeon Theodore Kocher (1841-1917), who then made similar pronouncements of thyroid function while addressing the Congress of German surgeons in Berlin in April of 1873. 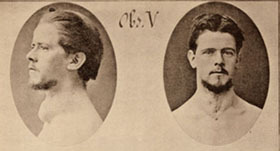 This began a long dispute between the two men over who was the first to describe the endocrine function of the thyroid. In a chapter of this essay entitled Accidents Généraux Tardifs, Reverdin makes pointed references to Kocher's public pronouncements, writing that Kocher's observations "are rather similar to ours in their principal features" and made "after having carried out a revision of his operations." The implication that Kocher's observations were revisions based on the work of the Reverdin brothers must have stung. Beginning in 1874, Kocher advanced the art of total thyroidectomy, applying Lister's antiseptics and reducing mortality rates from 38 percent to less than 5 percent even in those difficult cases of retrooesophagial extirpation, a technique which he pioneered. Kocher performed over 5000 thyroid operations in his lifetime and in 1909 received the nobel prize for his work. However, the nobel prize was awarded for his work in the physiology of toxic thyroid and by the least of rights it should have been shared with the Reverdin brothers. Based on their discovery, Jacques-Louis Reverdin made an important modification of the procedure of thyroidectomy by "respecting the enveloping membrane, or preserving a part of gland," finding that myxoedema did not occur as a result. 1 Revue médicale de la Suisse romande, 1882, page 539.